By now you already know that your garage door in the greater Maryland and surrounding area contains a number of moving parts. And in order for it to work at an optimal level, these parts must be functioning properly. One of the most important parts is none other than the garage door roller. If you are looking for a complete garage door roller replacement or repair, you can trust all your garage door roller woes with our technicians here at Better Place Garage Doors. They have the skills and experience necessary to get the job done. There are various reasons why a garage door roller is considered an important component. But perhaps the most significant one is the fact that it affects the door’s ability to function smoothly and properly. These mechanisms are responsible for connecting the door slab to the system’s tracks, and thus allow the door to move efficiently and swiftly in either direction. But when a garage door roller becomes cracked or broken, your door will get jammed. This restricts the door from closing all the way and thus leaving your valuables and home vulnerable to thieves and weather, among many others. In addition, a jam can cause indefinite frustrations to you and your family. A broken garage door roller should not be in the way of an easy and stress-free access to your home. We here at Better Place Garage Doors, your go-to garage door technicians in Maryland, believe that a garage door roller replacement is without a doubt important. With a professional garage door roller inspection, we can help you spot the early warning signs of faulty or broken garage door roller. We can detect these before you are faced with the possibility of a larger repair bill or, worse, accident. Our service provides excellent preventative maintenance and inspection, both of which are designed to avoid any roller issue from happening. The service also provides repair and/or garage door roller replacement if necessary. It is really difficult to determine when a garage door roller needs repair as compared to a garage door roller replacement. While in some cases a repair can get the job done, it is still likely for the same issues to appear in the long run. Meaning, you will still have to perform the same repairs (e.g. fitting, lubrication, etc.) the moment you will need them again. This is why a garage door replacement is always a recommended solution. Once you notice that your garage door is opening and closing in a slower pace than usual, the possible cause could be garage door rollers that are already worn-out. Just simply perform a visual inspection of your rollers — they can be found between your door and the guide tracks. If they appear to be dirty, it is time to take action. If they are cracked and/or worn-out, then do not hesitate to call for a professional help. Sure, basic cleaning can be done all by yourself, but a garage door roller replacement is best left to a certified technician. Leave the care of your garage door roller Better Place Garage Doors. Whether you need a simple repair or a full garage door roller replacement, we are ready to help. There is no task that is small or big to us. The inspection we provide is designed to determine if your rollers are worn out and need replacement. However, it is possible that from a simple garage door roller repair (i.e. clearing out debris, lubrication, etc. ), your garage door will be back to normal. Nonetheless, there are a few warning signs that tell us rollers are already worn out and, thus, need replacement. If you think that your garage door is louder than what it should really be, it is imperative that you replace the existing rollers. Do not worry – we will do the heavy lifting. Just call us and our team of expert technicians will be right there. How Can Better Place Garage Doors Can Help? 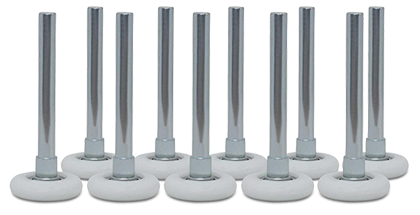 We here at Better Place Garage Doors offer you high-quality garage door rollers with bearings. Also, our garage door roller replacement is guaranteed to provide you with smooth operation and even off track prevention. All of these are achieved by using high quality rollers that are maintenance free. Even more so, our qualified and experienced technicians are equipped with the right tools and expertise that are needed to perform top-notch garage door roller replacement. You do not have to worry about costly solutions or expensive garage door parts. That is because we will help find and install the right garage door rollers, all of which are guaranteed affordable and efficient.